In fact I don’t think either major party has measured up as far as the economic management of NZ goes. Why? Well, its quite simple really. After the reforms of the Lange govt, which were good, we’ve gone to pot. Bolger’s sacking of Ruth Richardson was the start of it, and we’ve been sliding downward ever since. Then along came the Global Financial Crisis. Now this is why I am so critical of National, because the GFC gave them the impetus they needed to implement the reforms this country so badly needs. 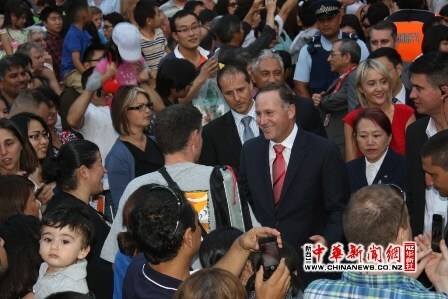 Driven by his desire for popularity, Key took none of the opportunities this crisis offered. The Nats decided the solution was immigration. Rather than cutting spending, reducing the size of govt, and other necessary but unpleasant solutions, the smiling waving Key kept things virtually as they were under Helen Clark, borrowing $300 million dollars a week to keep public services running, and decided upon mass immigration as a solution to raising GDP to keep pace with debt. The first generation New Zealander Key sold our culture and our heritage down the drain for the sake of remaining popular. Not to mention the chaos that is Auckland, where immigrants have settled in numbers far greater than could be accommodated, clogging roads and schools and driving house prices into the stratosphere. This country is on a treadmill it cannot get off. If immigration was closed off entirely, by 2021 the country’s GDP would drop by 9.6 per cent. This would drive debt to GDP ratios to unprecedented highs. So its not wise economic management that is keeping the country solvent, it is mass immigration. NZ’s traditional culture is being overwhelmed by immigrants from China, Korea, India and the Philippines to keep the bloated socialist ship afloat. Its not about diversity and vibrancy and all that rubbish, its about keeping the GDP up and thereby maintaining acceptable ratio of GDP to debt. So don’t tell me the Nats are good economic managers. They’re cowards who had the perfect opportunity to do something, backed by Key’s popularity and the GFC, and instead decided to poison the well of our culture. We desperately need good economic management in this country. It isn’t here now, and it won’t happen until we get better leadership of National. Or some other party. Either that or we flood the whole country with immigrants in a way that makes Auckland look like a barren desert and will make NZ as we knew it a distant memory. Precisely. Importing migrants boosts the population growth in order to create a sense of economic growth through housing demand and increased consumer spending. It’s all just a pyramid scheme in the long run. Yeah, and then not satisfied with changing NZ’s culture completely, to cap it off the prick has the arrogance to try and change our flag as well. The Nats are so useless, they should have gotten rid of Key long ago. Soon as he started backsliding on all his pre-election promises. And while they have this mass immigration , at the same time they introduce more and more rules and regulations that penalise/cost the producers that provide much needed income for the country. No need to be sorry for telling the truth Red. JK is a fiscal and social liberal. Yeah, you’re right, I probably shouldn’t have used the word. That said there are many about who see Key as a wonder boy and perceive any criticism as heresy. Most of them regard Key as a right winger, and only see left wing criticism as valid. They don’t get that on any normal political spectrum, Key and the Nats would be far left. Key has not taken the Nats anywhere, he holds power by such a slim margin he can’t govern the country, and he’s kept up economic appearances only by flooding the country with immigrants. I can’t see that as any kind of record for anyone to be proud of. Its pretty average IMHO. PS: Good to see that many of Commieblogs best commentators are popping over here to post. Yes, I read your quite reasonable comments there this morning and saw they had collected quite a few downticks from the Kiwiblog intelligentsia. Really, that GD is the pits with shallow fools like Stephieboy holding the floor, and the other psychotic nutjobs we both know so well. Keeping Stock is a good example of the hapless National supporter. Nice enough guy but completely besotted by John Key and the Nats even though they have betrayed everything they once stood for. What is it that guys like KS can’t see further than their nose? I also read Zerohedge for a similar number of years before commenng. Over there, there are some seriously sharp commentators (still some dross though) and I’ve learnt more engaging in debates than everywhere else combined. It’ll be for all of the same reasons that the OIO is such a pushover for any foreign buyout offer that comes along. This is not the worst part, worse than this, is the DECEIT! Have we analysed the consequence, have we had the debate, did we vote for this? Key is worse than Klark on almost every objective measure. KLARK and Kullen paid off Bolger’s debt – Key kept borrowing. Tax cuts. That’s right folks – ACT’s headline policy is one Klark abandoned for not being right-wing enough. What’s happened to NZ? Its lurched even further to the left after 9 years of Helen Klark socialism followed by another 6 years of John Key socialism. You can’t have these useless commie bastards in govt for so long and not expect a declining nation.